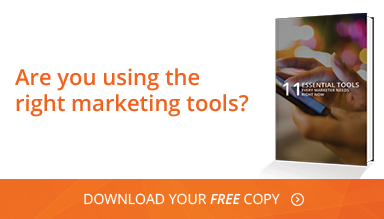 Are you up to date with your marketing tools in 2016? It may feel too early in the year to tell, but it’s important to stay current when it comes to technology that can make your life a lot easier. Every year, it seems marketing tools get more sophisticated with the ability to dig deeper for improved analysis. As the business world becomes more complex and competitive, you need to start looking into a bigger picture of how you're doing in comparison. At the same time, you need tools to help refine your marketing procedures so you don't miss some of the subtle aspects, particularly on your website. Because there are so many marketing tools out there, it's overwhelming trying to find something quickly to use at the beginning of the year. So we want to help you find some of the best tools out there that can help you refine your marketing campaign. Let’s take a look at a small group of marketing tools on the market now. You'll see how comprehensive they are in bringing more efficiency, plus saving you time. Here's an excellent little tool that helps you better analyze keywords and other website elements to keep you more competitive. As you start to grow your business, you'll want to stay ahead of your competitors every day. SEM Rush helps compile the most competitive keywords used in other businesses so you can get a picture of what others use. In addition, you can scope out competitive websites using the same keywords you've been using, plus potential advertisers that other businesses currently pursue. SEM Rush even gives you excellent comparison charts so you can get an immediate visual sense of what competing websites do. I’m personally in favor of maintaining an active blog right on your website, as that is the best way to boost SEO and draw traffic in. That being said, Medium is not a bad alternative due to its incredibly easy-to-use nature. That's only enhanced because it has its own community of readers, so you can get an immediate large audience. Those readers also tend to engage heavily on every blog to get discussions going. This tool has easy integration with Twitter, so it's worth considering. You can even transfer your old blogs into Medium's format, which does look outstanding. One of your likely goals for 2016 is getting more website traffic, and Kuia is one of the emerging tools on the market for providing everything you need. They give you numerous tools for attracting people to your site, from pop-ups to social media sharing buttons. Many of their templates look professional, and almost all of them have interactive elements so first-time visitors engage for more entertainment value. Another attractive branding element to Kuia is they promise you can create one piece of interactive content on your site in less than 16 minutes. Let's not forget the power of video on your website as a powerful marketing tool to inform and entertain. It's not always easy to create them on your own, and the Videolean site helps you create a video template for any type of video marketing idea imaginable. Whether it's an explainer video you need or even just an infographic, they have some impressive video designs you can easily customize. Videos do a lot for your SEO as well, so it's worth checking out this site to save you all the effort in having to hire a video production company. Regardless of whether you employ these new tools or stick to the classics, it’s important to enter this new year with a clear view of your marketing strategy and how you plan to execute it. Such helpful tools can help keep you organized and efficient, so you can focus your time and energy on building killer campaigns, not wandering in the dark.